Most contract manufacturers out there do a very good job. They (we) build quality products, deliver them on time, and at competitive prices. Yet the above are a few of the troublesome dynamics common in the industry today. I’ll go out on a limb and suggest a reason for it: it’s because of the way most CM’s approach their customer base. Develop expertise in how to design and build products. Build as many of their products as possible, even if they’re not a great fit. Extend/expand capabilities to build even more of their products over time. Ask the question: have we met our growth goals? If yes, keep the customer(s) happy; buy a fishing boat. If no, go back to 3rd bullet above: Find a customer. The point, of course, is that it is often the customer base itself that can determine the ultimate size and direction of the CM firm. If the first two customers happen to come from the same industry, voila, that industry becomes the “chosen” market niche. 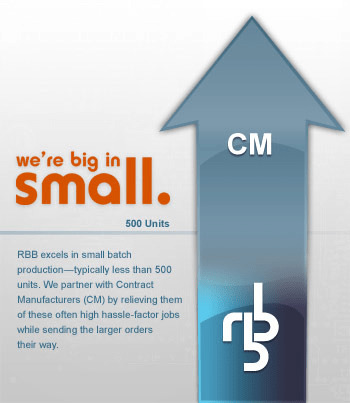 Most contract manufacturers go through life growing (or shrinking) one big customer at a time. They throw their arms around the customer, doing everything possible to lock in the relationship. On paper this sounds reasonable but as a practical matter this strategy can cause needless constraints and over-dependence between the parties. Customers can be limited to the capabilities and responsiveness of the CM, while in turn the CM may have its eggs in too few baskets. Unit costs come down as all suppliers finely tune their operations instead of providing higher overhead “full portfolio” services. It would allow all the businesses in the supply chain to grow as desired without being unnecessarily tied to the fates of the others. customers’ small batch needs of all kinds: prototypes, early production, second tier product lines, legacy products, and others. Just as important, we specifically steer clear of the very large production runs that are best handled by our independent large batch partners. In this way, our customers get very competitive pricing and service no matter what their evolving needs are. Future blog posts will deal with how we make this work for all those involved. In the meantime, if you represent a progressive thinking contract manufacturer who would much prefer focusing on large batches… and would also love to partner with someone to take the small batch headaches out of your schedule, please contact me directly. We are expanding our reach nationally and are actively looking for additional highly qualified large batch partners. Bruce Hendrick has been a leader of major change in corporations and small business alike for the past 25 years; currently he's the owner of RBB Systems and Organizational Development Services, LLC; noted speaker, author, active church member and community volunteer.